It is cheaper to feed ourselves, our children and our families cheap, sugary, unhealthy and basically crappy food than it is to feed them excellent, nutritious, healthy food. 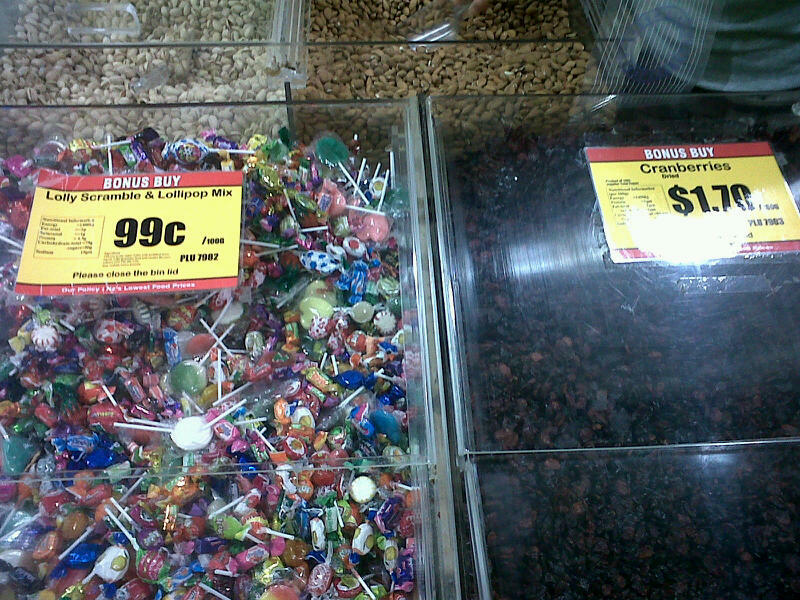 I couldn’t get a photo side by side of the lollies with vegetables, but apart from carrots (and a wonderful special on capsicums – $5 for 1kg), most of the fruit and vegetables were more than $9.90 per kilogram. A six-pack of single serve pies is $5.99. Meat seems to be starting at over $10 a kilogram. And this is at a supermarket which is 15% cheaper than most of its competitors. It’s no wonder that young people, the poor, and those poorly educated about food take the cheap options. I’ve noticed that junk food was cheaper than healthy food in New Yealand, the US, and Canada. And the result is fatter people for sure… I’ve also noticed that sweets and drinks were much sweeter than in Europe. There’s definitely something to do about it. I noticed the price disparity in the UK as well, especially with fresh fruit and vegetables. On the other hand, excellent wine in France was ridiculously cheap and you don’t hear me complaining about that 🙂 I don’t drink much apart from water (and wine :-)) so don’t notice the sweetness of drinks too much. We do have a wonderful amount of fresh produce here in NZ, and it is reasonably priced (my mum has just moved over from England and says almost everything is cheaper), however cheap fast food makes it an easy option for people who don’t understand how bad it can be for you. Thanks for stopping by and I hope your first few weeks here have been great! The weather has been beautiful at least. I think people need to get out of the supermarket and look around. We go to the Avondale Markets on Sundays (they’re 10 mins from home which is nice) and we can buy all the fruit and veges for our 2 and a half person (have a under 2yr old son) household for under $20. Its just hard work to carry kilos of food back home. We also have a vege garden and Corey loves getting stuck in and pulling weeds. Start the crusade, you’ll get tonnes of support from most people. Adam, you’re totally right about using things like the local markets! We’re only 10 minutes from the Avondale markets too, and really should go more often! I tend to buy fruit and veg from the vege shop, and we use Foodbox as well, which helps keep the costs down. And we’re keen on healthy eating, so our own vege garden provides quite a lot of produce. 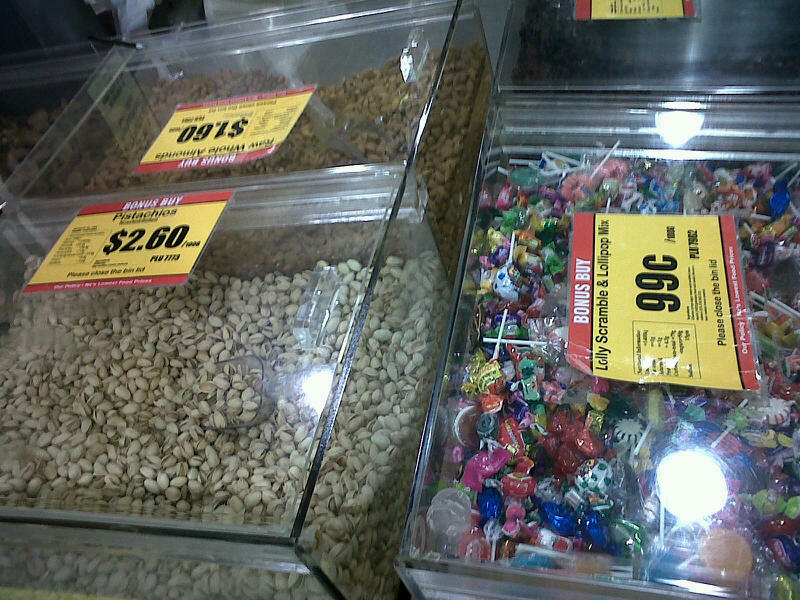 The bulk bins just struck me as such an interesting juxtaposition! Thanks for stopping by and commenting.